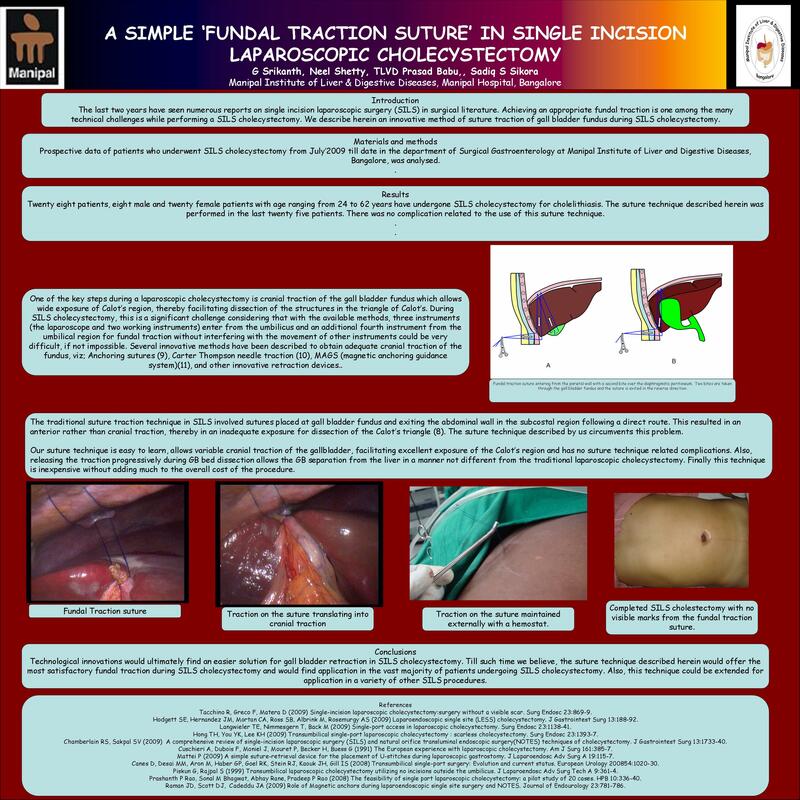 The last two years have seen numerous reports on single incision laparoscopic surgery (SILS) in surgical literature. Achieving an appropriate fundal traction is one among the many technical challenges while performing a SILS cholecystectomy. We describe herein a simple method of suture traction of gall bladder fundus during SILS cholecystectomy. Prospective data of patients who underwent SILS cholecystectomy from July’2009 till date in the department of Surgical Gastroenterology at Manipal Institute of Liver and Digestive Diseases, Bangalore, was analysed. Eight patients, three male and five female patients with age ranging from 28 to 62 years have undergone SILS cholecystectomy for symptomatic uncomplicated cholelithiasis. The suture technique described herein was performed in the last six patients. There was no complication related to the use of this suture technique. Technological innovations would ultimately find an easier solution for this problem. Till such time we believe, the suture technique described herein would offer the most satisfactory fundal traction during SILS cholecystectomy and would find application in the vast majority of patients undergoing SILS cholecystectomy. Also, this technique could be extended for application in a variety of other SILS procedures.